My Time-Tested Strategy To Save the Endangered United States Middle Class and Small Business! 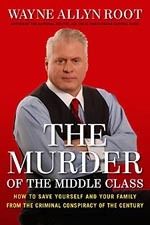 THE most important chapter of my new book, The Murder of the Middle Class is entitled, The Middle Class Weapon of Self-Defense. I explain why hard-owned money (physical gold and silver coins) are the only trustworthy foundation upon which you can build a family financial survival plan today. History reveals that precious metals serve as "wealth insurance" against all types of economic disaster. WHY? Because decades of BAD economic policy (by the Fed and politicians) will soon drive the cost of living (and gold) through the roof! 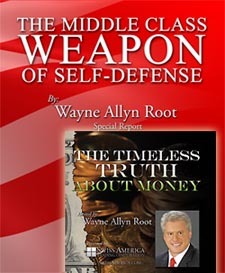 Thanks to Swiss America, I'm able to offer you a copy of this vital chapter The Middle Class Weapon of Self-Defense from my new blockbuster book FREE! As a BONUS they will also include my 2014 DVD ... The Timeless Truth About Money which further illustrates why owning gold today is no longer a luxury ... but rather a necessity! Please call or click NOW! my FREE SPECIAL REPORT & DVD!